“NaMo TV is a feature of NaMo app which is run by BJP IT cell. (The) Party has taken slots on DTH for which provisions are there to show it,” Amit Malviya, head of BJP IT Cell, told The Indian Express. The Bharatiya Janata Party (BJP) on Wednesday admitted that the NaMo App, of which NaMo TV is a feature, is run by its own IT Cell. So far, nobody had publicly taken ownership of the channel, although the official handle of BJP and personal handles of Prime Minister Narendra Modi and Union Minister Piyush Goyal, among others, tweeted about the channel, asking people to watch its election-related programmes. This admission by the ruling BJP comes close on the heels of the Delhi Chief Electoral Office’s Media Certification and Monitoring Committee’s (MCMC’s) response to the Central Election Commission that the NaMo TV content — pre-aired speeches of Prime Minister Narendra Modi — did not qualify as advertisement. The Commission had asked the office of the Delhi CEO to direct its Media Certification and Monitoring Committee (MCMC) to check if the political content aired on NaMo TV was pre-certified. NaMo TV showed speeches of PM Narendra Modi after 5-pm deadline. Top officials at the Delhi Chief Electoral Office told The Indian Express that the Media Certification and Monitoring Committee (MCMC) had “only certified” the NaMo TV logo, and it was not their “mandate” to certify the content since it contained pre-aired speeches of Prime Minister Narendra Modi which were not advertisements. A Commission official confirmed that the clarifications sought have been received and were being processed. “The Commission’s order on NaMo TV is expected on Thursday,” the official said. “We have now sent our response to the Election Commission. We only certified the logo. The content we received for certification was not for NaMo TV specifically. It was for TV and social media publicity in general. We did not certify it for the reason that it does not qualify as an advertisement,” the official said. “For example, if Modi has delivered a speech in Parliament or appeared on Rajat Sharma’s show Aap ki Adalat — it’s already in public domain. There was nothing new. So, we returned the request for application saying that it was not an advertisement, since it was in the public domain,” the official added. The official in the Delhi CEO’s office said Neeraj Kumar, National Election Committee member of the BJP, had applied for certification for both, the NaMo TV logo, and the content. Neeraj Kumar is part of BJP IT cell and the liaison officer who looks at Election Commission-related issues of the party. 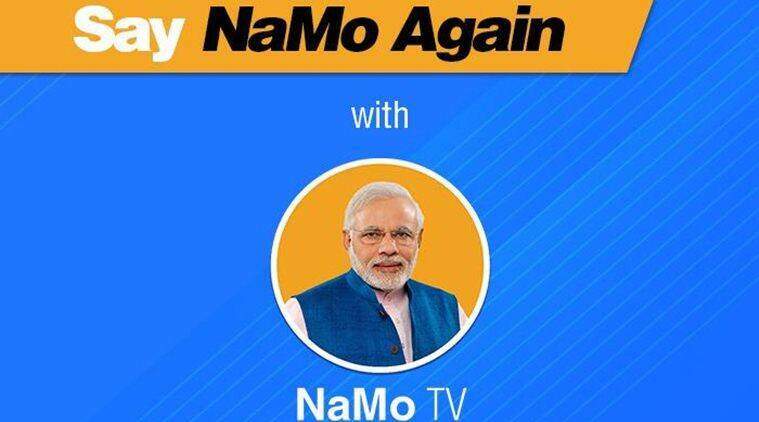 The BJP has finally owned up NaMo TV. This brings clarity on ownership of the channel, but it still operates in a grey space allowing it to beam across households without requiring government permission. This is where the Election Commission has stepped in now with Opposition parties pointing to a non-level playing field for NaMo TV. Now that the Delhi Electoral Officer’s Media Certification and Monitoring Committee has told the Commission that certifying the channel’s content is beyond its purview, the ball is squarely in the election watchdog’s court to take a call that upholds the sanctity of the Model Code of Conduct in letter and spirit. Available across major DTH platforms in the country, NaMo TV was described as a “platform service” of DTH operators by the Union Ministry of Information and Broadcasting in its response to a notice from the Commission. The I&B Ministry is learnt to have told the Commission that since it was a platform service offered by DTH operators which did not require uplinking/ downlinking permissions, it is out of the ministry’s purview, and left it to the election watchdog to take a call. Several Opposition parties, including the Congress and the Aam Aadmi Party, had complained to the Commission, asking if NaMo TV had obtained permission from the I&B Ministry, and if parties can launch channels after the Model Code of Conduct kicks in. 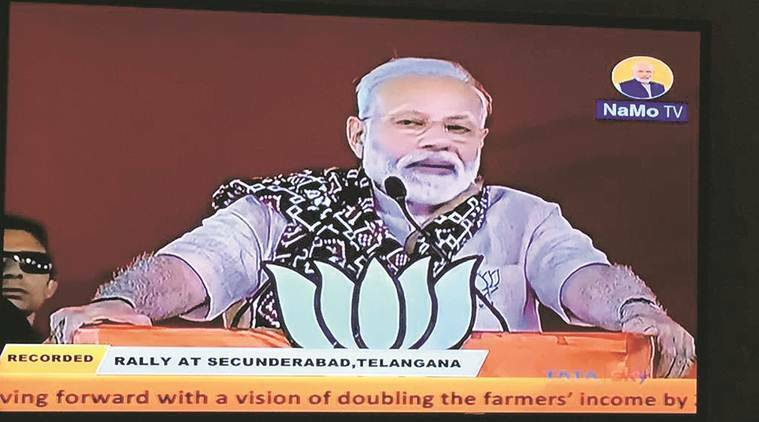 NaMo TV continues to beam into millions of households despite the commencement of the silence period — elections in the first phase will be held April 11 — that disallows further campaigning in any form in poll-bound constituencies.